You’re panicking. You need more content. You need better content. Yeah, you do. But your SEO also has to be on point. Content marketing would not fare well in the #tenyearchallenge. This sphere of the digital world has seen drastic change in recent years — much of this shift has to do with a constantly evolving search-scape, along with how users are coming upon content. Newer, nuanced algorithms have altered how people use search engines and how marketers create/govern content. When content underwhelms, the anxious response is to create more and more of it — don’t do that. Creating mammoth volumes of the same under-performing content will often result in an identically under-performing result — just at a greater expense of time, energy and sanity. Adding more content to a shoddy existing site architecture will make it even trickier for Google to find and rank your content (and they can find anyone). SEO used to be so easy, right?! Well, it was never easy — but it was easier. All one had to do was consult the keyword rankings and mindlessly jam-pack your content with the hot ones. The salad days of keyword stuffing have been tossed. Keyword rankings are an antiquated metric, in that they don’t take into account the context of who the searcher is or where they’re searching from. A keyword search from a Millennial in Paris, France will vary wildly from the same keyword search courtesy of a Boomer in Paris, Texas — and it doesn’t even begin to acknowledge the intent of the searcher (more on that in a bit). What’s a snippet? It sounds cute, right? It is — and powerful. As shown above, it’s the box that shows up when you Google anything that features (in all likelihood) the most concise and accurate response to your query — streamlining the user experience by saving the need to scroll through more content after your search. Google’s all about featured snippets — one study found that for a million-plus queries, a third showed a snippet in response. 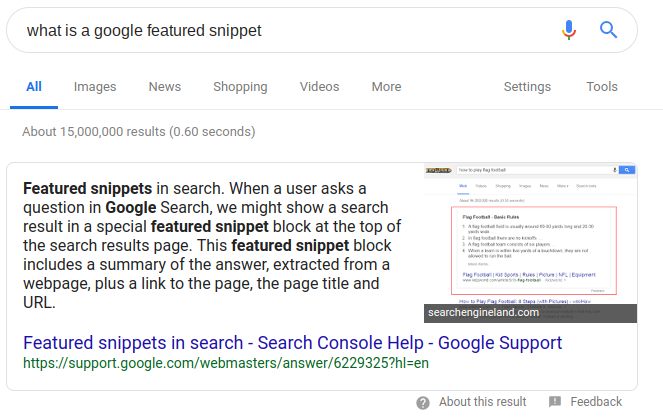 Any featured snippet content yields an oligarch’s ransom of SERP traffic — and the game has begun for content creators to get their slice of gluten-free snippet pie. Want to guess who’s winning the snippet war? Clipping the competition? Perhaps you want to Wiki it? That’d be apropos, as Wikipedia is currently killing it — owning at least 11% of all featured snippets. Meanwhile, Google is making moves and investments in machine learning — such as RankBrain — to embellish their core algorithm that indexes and ranks content. The company is trying to understand the intent of a search query (told ya I’d come back to it), even if it’s not explicitly stated. If this sounds a little too Black Mirror-tech-dystopia, think of it more of a collaborative effort of robots, content marketers and searchers all figuring out how the other thinks (until we all merge into sentient cyborgs). In the interim, it’ll be easier to Google things! People don’t think in keywords. They don’t think in hashtags. And tech knows this. With the surge of mobile/voice search, internet queries are getting more specific, more conversational, more human. Even up until a few years ago, most searches were misspelled fragments with no proper syntax — now, peeps are actually asking for things with full sentences (hold the applause). Google’s updates are grappling to comprehend natural language processing, including the roll-out of Hummingbird — a search algorithm that analyzes keyphrases, not mere keywords. Sorry, keyword fiends. Now, there are thousands of long-tail variation phrases that are frequently searched for any given topic (with changes based on geo location) — all of this fits well into content creators/marketers having long-form content on one’s pillar page to maximize SEO. Yes, your content needs keyphrases/healthy SEO — the same way a pop song needs a melodic hook/sick beat — but SEO just gets users to your site. It’s imperative that once they’re there, you as content creator provide substance upon their arrival. The real keys are words, and ultimately an algorithm doesn’t decide (yet) what good content is — this is still up to humans (for now). Any digital agency worth its code is where art, science and commerce meet, where the digital and analog converge, where subjectivity and objectivity are forced to get along — as the masses plug in their trillions of Google queries, you and your digital organization should always be searching to improve your content creation and strategy, as we do at WDG.